Tyndale wrote a “book” in prison to defend his chief doctrinal standard: Sola fides justificat apud Deum—Faith Alone Justifies Before God. This was the key issue in the end. The evil of translating the Bible came down to this: are we justified by faith alone? Tyndale stayed in that prison through the winter. His verdict was sealed in August, 1536. He was formally condemned to death at the stake as a “heretic”. He was strangled by the executioner, then afterward burnt up. It is said his last words were, “Lord! Open the King of England’s eyes! 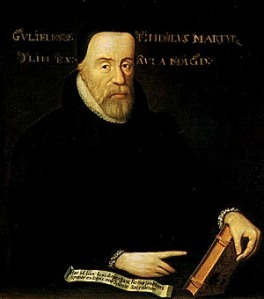 As The Cambridge History of the Bible expresses it: ‘England was fortunate to have in William Tyndale a man who could do what was wanted, a man of sufficient scholarship to work from Hebrew and Greek, with genius to fashion a fitting English idiom and faith, and courage to persist whatever it cost him.’ Perhaps his faith and courage were the most decisive factors.